Is Grenache on the up? Tony Keys wrote recently about this just recently, noting that Grenache and Grenache-based reds were enjoying increased popularity in the states. Is this the start of a Grenachaissance? If it does, no doubt a few Barossa growers/winemakers will be happy, and so should they be – Australia has an amazing, unappreciated old vine Grenache resource, with the best wines about as close to Barossa (or McLaren Vale/the Clare Valley for that matter) Pinot as you’ll get. Sadly we’ve still got a way to go, as dry-grown, 100 year old Barossa Grenache fruit still sells for circa $900 a tonne and finds relatively few buyers. A long way to go. Anyway, here are a few Grenache/blends that I’ve enjoyed in recent tastings. Extra background bits in italics. 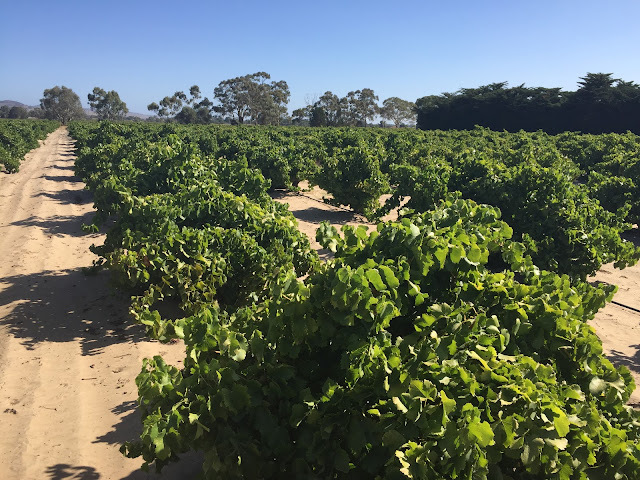 The photo above is from the 1850 Cirillo Grenache vineyard – it really does look like a beach. Sourced from the 70 year Romano vineyard at Seaview in McLaren Vale. Wild yeast fermented with 25% whole bunches. Unfined and unfiltered. Dark rub coloured, this has a dark berry, slightly candied red fruit nose. Carbonic red fruit juiciness but with a dash of whole bunch pepper and clove. Spicy, slightly bitter palate is a riot of purple and red fruits, the oak a distant last, meaty characters writ large. Really juicy cranberry style with soft tannins and a juiciness, layered with spice. Maybe a little simple, but genuinely tasty and has welcome spice. Best drinking: 2015-2023. 17.7/20, 92/100. 14.5%, $24. Grenache from McLaren Flat and Shiraz from Seaview. 9 months in older oak. Bright red ruby colour. Light red juicy red currant nose with minimal oak, lots of juicy red lolly fruit and a soft finish with minimal tannins. Easy and primary, a simple. solid light red. What’s missing here is something to take it beyond simple fruit. Best drinking: 2015-2020. 16.5/20, 88/100. 14.5%, $25. Sourced from several vineyards, all 70 years old or more. Produced in a combination of closed and open fermenters with a decent pre ferment maceration. A combination of barrel and tank maturation. I’m biased as I was helping at Cirillo when this was bottled – hence I’m not going to score this. I really like this wine and Marco Cirillo takes Grenache very seriously and it shows. Genuinely Grenachey, this has lifted, sandy red fruit and raspberry jam, the gentle red fruit palate full of slurpable fruit and an out and out generous palate, a tight finish and some late raspberry fruit. Softly softly, gentle but it has concentration and a real vibrancy. Drink: 2015-2025+. 14%, $25. Sourced from 155yr old vines at Springton in the Eden Valley. 30% whole bunches, fermented wild in an open wooden vat. 12 months in older oak. Dark ruby, the nose is really closed and compact. Underneath the palate it tightly packed, an array of dense red fruits and just a little mint. Even with time in the glass this looks long but a little closed and lean, briary and tannic with fine sandy tannins. High quality wine, just desperate for time – the tannins notably good for thin-skinned Grenache, and length spot on. Best drinking: 2016-2030. 18.1/20, 93/100. 14.5%, $100. From the Matchschoss vineyard at Greenock. Sees much more new oak than other wines here. A very different beast in this lineup. Purple black, the nose is purple fruit, every bit the dark berry Greenock style, the palate with deep berry flavours and dominant chocolate oak. Big and bold, it’s no Barossa Pinot, more like a Shiraz Grenache. But you can’t help but marvel at the style – it’s a rippling, muscular Grenache, with oak and fruit filling every pore. Definitely has a place and high quality, this will please the hedonists, even if I couldn’t finish a bottle. Best drinking: 2015-2026. 18/20, 93/100. 14.5%, $195.